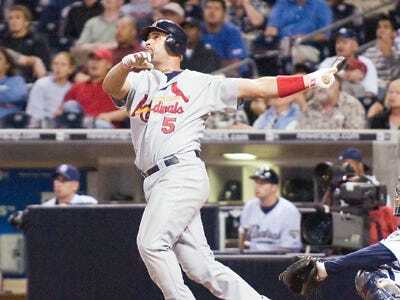 Albert Pujols and the St. Louis Cardinals continue to work on a contract extension. If the two sides can’t reach an agreement by tomorrow, Pujols will test the free agency waters next winter. Reports indicate that Pujols is seeking a deal similar to the 10-year, $275 million deal Alex Rodriguez signed with the New York Yankees prior to the 2008 season. But it is hard to imagine that the Cards will commit up to $30 million per season to one player when their entire roster made $93.5 million in 2010. So, would Pujols be willing to take a “hometown” discount to stay with the Cardinals? Not if he feels that he already gave the Cardinals a discount with his last deal, a contract that will pay him $111 million over eight years. And if we look at his production, Pujols certainly has a case. In his first 10 years in the big leagues, Pujols has been worth 80.7 wins, or about $286.3 million worth of production. That is almost $190 million more than the $96.7 million the Cardinals have paid him so far (he will be paid $16M in 2011). For a comparison, Alex Rodriguez was worth 79.9 Wins in his first 10 full seasons and yet he was paid $120.1 million. And that was in 1996-2005 dollars. And yes, Pujols has been a better all-around* player in his first 10 seasons than A-Rod. So no matter how you slice it, Pujols has outplayed his paycheck. And one can argue that he has done so three-fold. 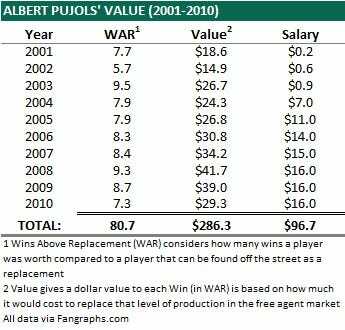 So when Cardinals fans wonder what happened to the “hometown” discount next season when Pujols is playing for the Cubs, they can look at the last 10 years. *WAR considers both offensive and defensive production.